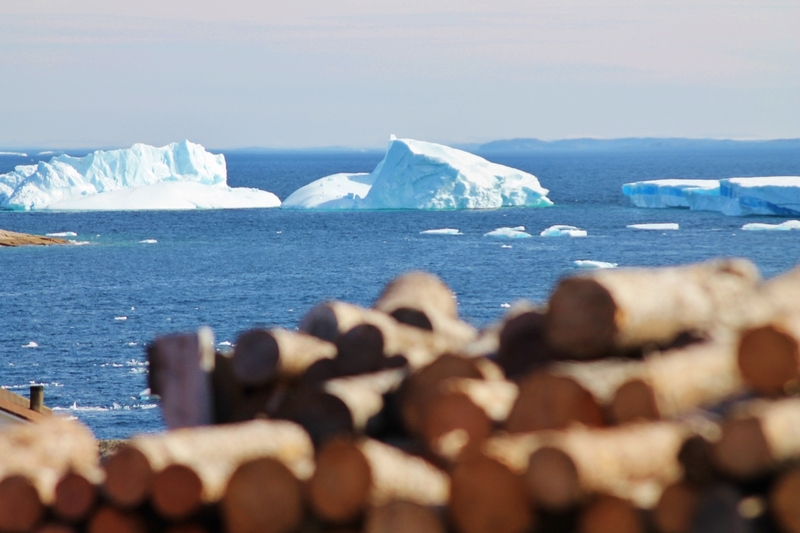 Iceberg Alley is what we call the area stretching from the coast of Labrador to the northeast coast of the island of Newfoundland, and the best time for viewing bergs is late May and early June. Saturday was beautiful and sunny, so Paul and I decided to drive to Greenspond to see if there were any icebergs close enough for good snaps. 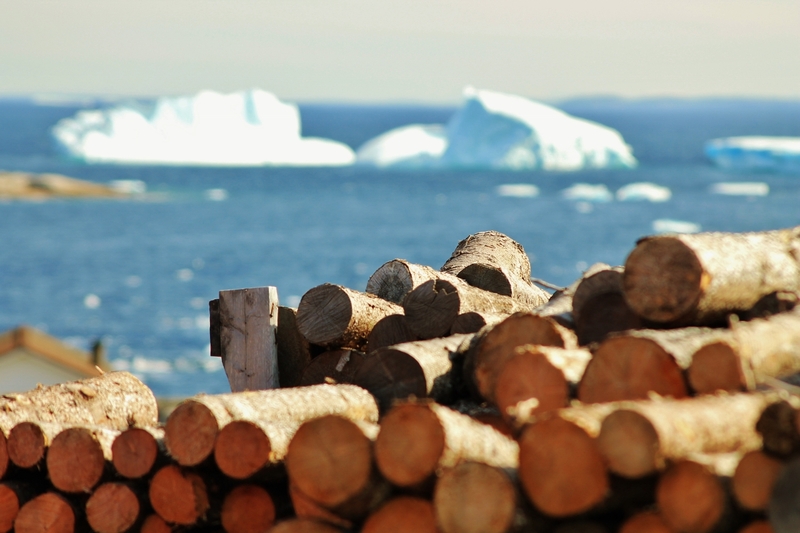 Before we entered the town, we were delighted to meet a few of them next to Greenspond’s causeway. I can’t remember ever getting this close to a berg so huge! This group climbed down on the rocks to get a closer look. Close-up of a tiny waterfall on the iceberg. 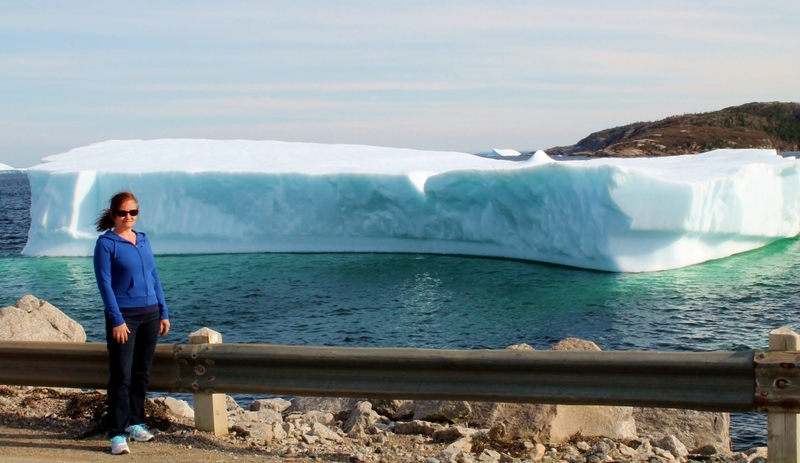 We drove on into Greenspond to discover even more of the frozen beauties from the North. Well, hello there, giant hunk of glacier! This one makes me think of a flying saucer. Notice the deep blue middle. A splendid view from this property. Have you ever gotten up close and personal with an iceberg? Never say never! As nice as the pics are, it’s hard to capture the enormity of them the way they appear in person. I can imagine! So funny how we get used to seeing things based on our geographic location that can be so foreign to someone else! Stunning! No, I have never been close to an iceberg. It is difficult to even imagine as most of my time has been on the edge of a desert. From icebergs to desert — quite the contrast! Thanks, Lea. These look incredible! I am going to Norway and Iceland next month so I’ll certainly post some pictures of any “bergs” I happen upon. Norway and Iceland?…nice! Have a great time! I bet! 😄 thanks for commenting! Beautiful! ❤ Jennifer, I've never see icebergs in person—but your pictures make them seem up close and personal. Wendy, you would love them up close. They exude a quiet majesty and even with a good camera it’s hard to capture their sheer immensity! They are breathtaking shots Jennifer. To be so close … and in such a pretty place! Thank you for sharing something I had absolutely no knowledge of!! Great pictures! I want to be there! Thanks. You would be welcome! Stunning shots. I haven’t experienced this yet but Iceberg Alley is definitely on my bucket list. Incredible photos, Jennifer. I’ve nver been that close to an iceberg but it must be equal parts beautiful and intimidating. Thanks! They are, George. They can be dangerous if you get too close and they decide to flip or crack open. Tour boats have to be cautious. Amazing photos, Jennifer! I always wonder if people who live by such awesome scenery realize how gorgeous it is. That guy is working on the back of his house, but does he realize…iceberg??!! Jennifer, so, so wonderful I have only seen them from a distance on a visit to New Zealand. What spectacular photo’s. I always say you live in a very beautiful corner of the globe. These are amazing. I think they come from the Glaciers Jennifer so awesome and you must realise most people don’t get to see what you see. Truly special and love seeing your photos of the land around you. Feeling a little bit better every day, test results good, now its time to rest and mend. Thanks for your concern. 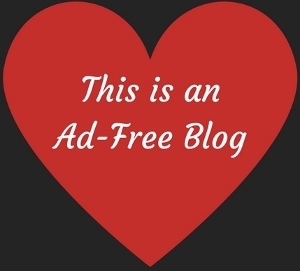 Kath, thanks for the link, I love learning more about the world especially the world near my friends. I do appreciate living in close proximity to such majestic beauty in nature as iceberg alley certainly is. Would you consider sharing on my fb page Newfoundland Iceberg Reports? We were there on Sunday but I only shoot and blog on my tablet so my pictures can not compare. Lovely! Thanks for the invite. 🙂 Will I find it under that name? What wonderful pictures, Jennifer. Such power! And they’re such a tiny part of wherever they calved from. Thanks for sharing these. Thank you, Jacqui, and you are welcome! Even getting close to them, the camera still doesn’t quite capture their immensity and grandeur. I can’t imagine how giant the actual glaciers look. It boggles the mind. It was warm on Saturday, Carrie, so the whole adventure was quite pleasant.